Ascend software is compatible with Quickbooks. If you want to use Quickbooks for your shop's accounting, you'll need to set up a Quickbooks account first. After your account is set up, and the Chart of Accounts (COA) is updated, you can add that information to Ascend. The next step is to go into Ascend and map the Categories, Inventory Adjustment Types, Payment Types, Tax Rates and Options with the corresponding General Ledger Account Number from QuickBooks. 1. In Ascend, navigate to Database Explorer > Categories. 2. Select the Parent column (click the word Parent specifically!) to sort by Parent categories and place all Parent categories at the top of the list. For the Parent categories themselves, this column should appear blank (because they don't have Parents!). Ideally, your shop should have no more than 11 Parent categories. 3. Double-click a category to open the Edit Category window. 4. 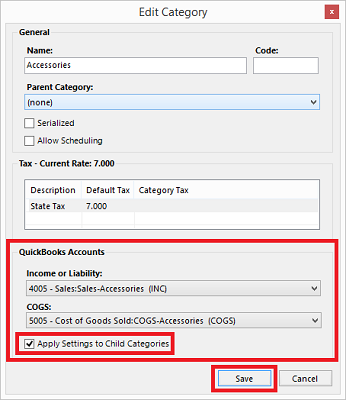 Map each Parent category to an income sales account number, and COGS account number from the Quickbooks' COA that was imported into Ascend. Do not map your Categories to anything other than Quickbooks income accounts. If you do, your P&L Income value will not match your Ascend Activity Summary. 5. Check the box for Apply Settings to Child Categories. 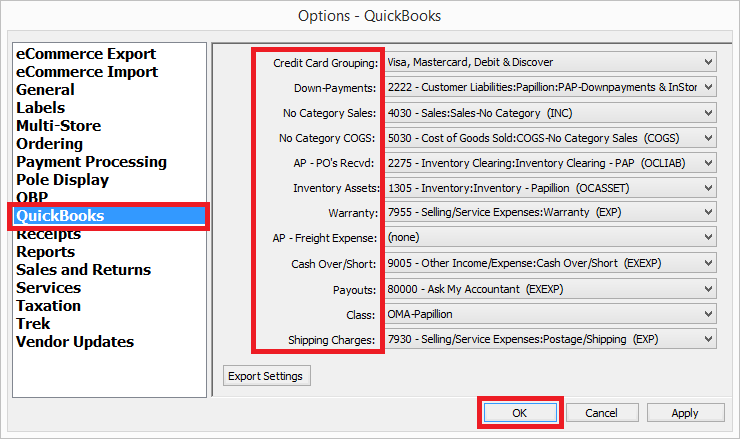 The reason we map Inventory Adjustments to our Quickbooks accounts is so Quickbooks knows where the offset of the adjustment should go. The inventory asset account mapped in Options is the other half. 1. In Ascend, navigate to Database Explorer > Inventory Adjustment Types. 2. Double-click on an adjustment type to edit it. 1. In Ascend, navigate to Database Explorer > Payment Types. 2. Double-click on a payment type to edit it. 1. Navigate to Database Explorer > Tax Rates in Ascend. 2. Double-click on a tax rate to edit it. 3.Select the apporpriate account from the Quickbooks dropdown. The State Tax Rate should be mapped to the Quickbooks Account called Sales Tax Payable (OCLIAB). If you have mutliple taxrates for City, County, State, etc., they can be listed separately. 1. Select Options > Quickbooks in Ascend. These need to be re-mapped per payout. This is an offset to freight charges. DO NOT map to an income account. This is totally optional, but might make things a little easier for you. 1. In Ascend, select Help > Open Ascend folder. 2. Right-click the Export folder. 3. From the dropdown menu, select Send to > Desktop to create a shortcut. The folder Export - Shortcut will appear on the computer's desktop, so you can easily find and access it when needed!